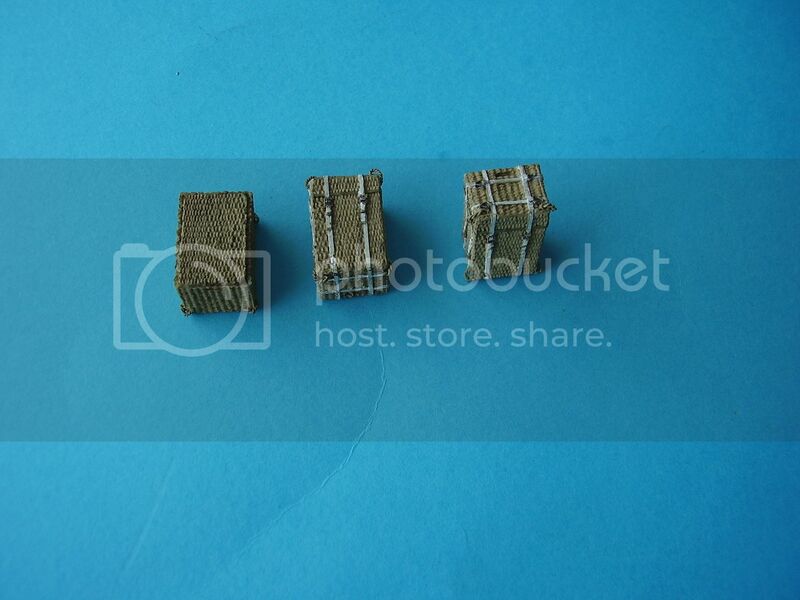 Among the large range of accessory sets that Resicast make are a unique and useful set of airborne containers, these provide a neat addition for modellers of airborne dioramas and small scale scenes. One reason for my interest and enthusiasm for the company products is not simply the outstanding quality and detail of the kits and conversions, but the large and really useful range of additional British equipment and stores they manufacturer. 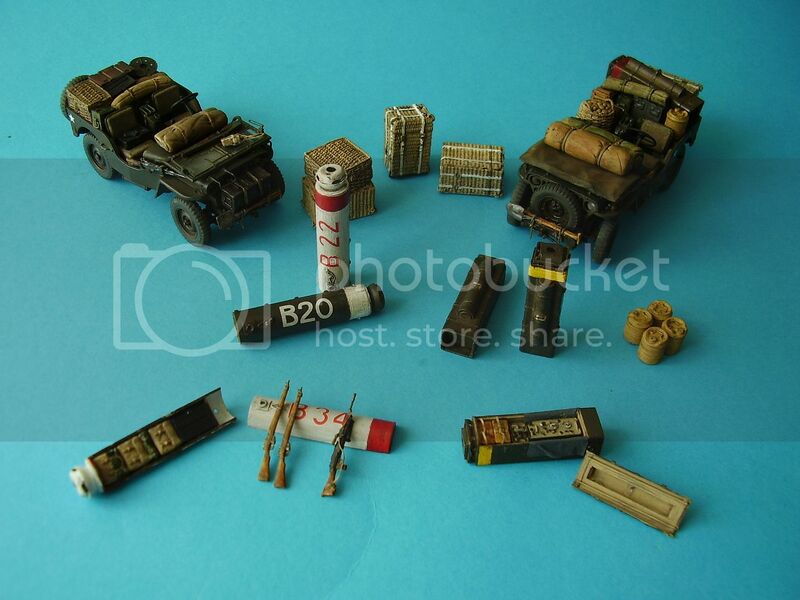 This is a quick look at set 35.2230, a set of 6 airborne containers and 3(4) wicker baskets with airborne petrol cans. British Airborne troops used a variety of containers and panniers, to air drop equipment and re-supply the troops once on the ground. The Mark I rounded container used for a wide variety of supplies, the Type E was a smaller square container used for the No 18 set, the Type F a larger square container used for the No 21 set, along with wicker panniers for rations and medical supplies, and a Type H container made up of 5 separate cells, containing a variety of ammunition types. Packed in the standard sturdy Resicast box, this set contains 6 x Airborne Containers of two different types along with 3 x wicker panniers and 4 x airborne petrol cans. Cast in a light grey resin with excellent detail I could see no major flaws with the individual pieces. To accompany the set you get a 2 page A 4 combined reference and instruction sheet. This is in the older style Resicast instructions with page 1 containing a list of the set parts, build instructions in the form of B & W photographs of the real kit with kit parts identified by letter. The reverse contains further build instructions, reference pictures and a painting guide. On the front of the box is a slightly blurred image of the painted set that, although not as sharp as one might like, should still give a reasonable reference for painting. 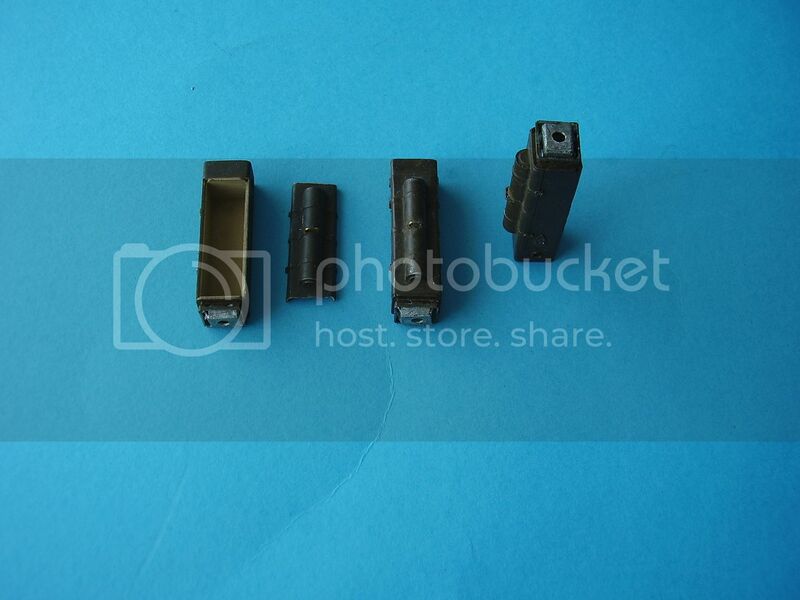 You get 3 x type F containers, two of which have closed tops and one of which has an open top and is hollow inside. 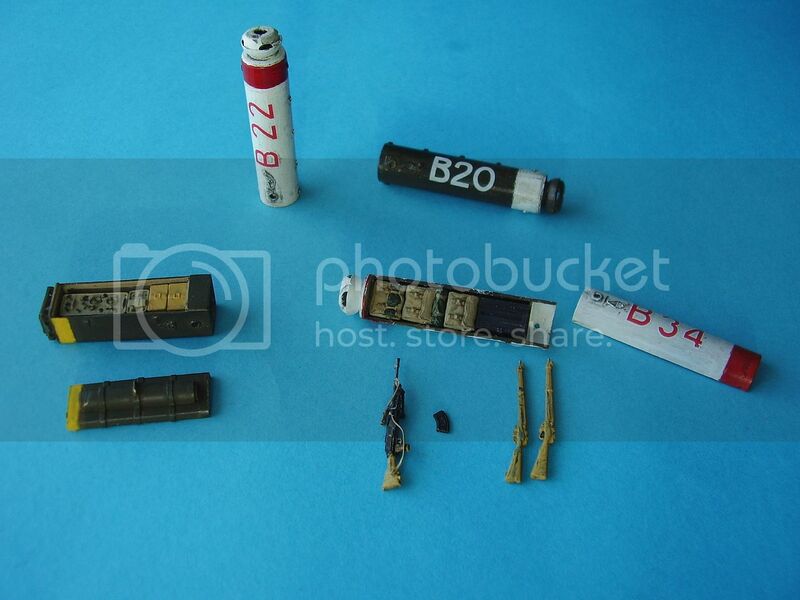 These were metallic containers and normally used to air drop wireless equipment in the form of the No 21 set. From the references I have for these containers, the set would appear to be an excellent representation of the real kit. 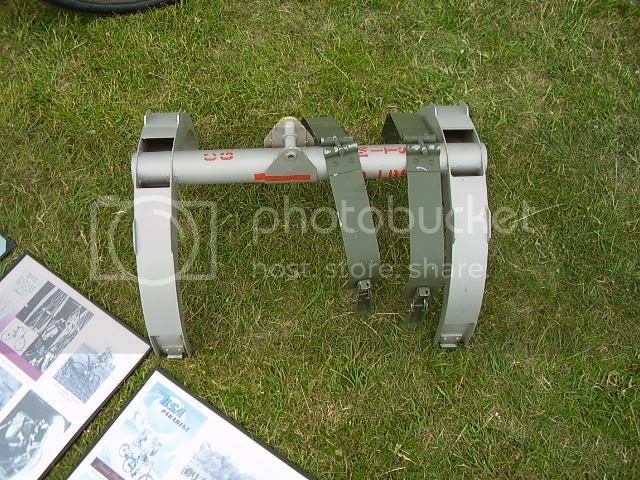 To fit with each set you also get the top and bottom crash pan parts which composed the perforated metal shock absorber. You will need to fit a small handle to the centre rib of the lid on each container, and some radio equipment for the open container might be useful depending on you’re intended purpose. Again you get 3 x Mark I containers. 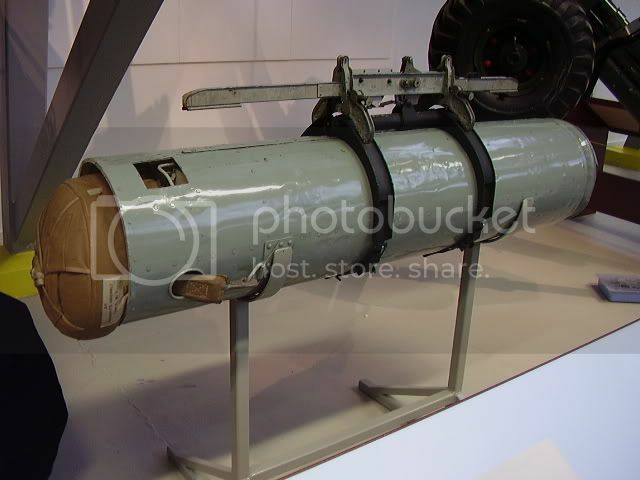 The Mk I containers were used for all sorts of supplies including light weapons, rifles, light machine guns, mortar bombs, ammunition, haversacks and the like. Two of the containers are closed with the 3rd being open in 2 parts. Again from the references I have these would appear to be excellent representations of the kit. Option 1: 5 x haversacks, 1 bandolier for 7 Sten magazines and 2 x No 4 rifles, weight 116kg. Again you get the top and bottom crash pan parts which composed the perforated metal shock absorber seen on these containers. In the parts listing you get 2 x closed panniers without straps (parts K) and 2 x closed panniers with straps (parts L). My set had 2 baskets with straps and 1 without. However, also in the listing are 2 x airborne petrol cans and I got 4 of these so can’t complain. The wicker panniers are nicely cast with good texture representing the wicker finish, and the two panniers with straps have the correct strap arrangement with the buckles present. The only thing you will need to add are the 4 rope carrying handles on the corner of each basket. Panniers could contain clothes, rations or medical equipment. These provide a good representation of the cans with the broader top lip and cap being present and ribbed sides of the cans clearly shown. In addition similar colour coded markings would be used on the containers, and metal triangle plates were used on the wicker baskets. Unfortunately no decals come with the set so you will have to improvise based on need and, of course, your references. A very well detailed set of containers and baskets giving an excellent representation of the kit. A few of the crash pan parts for the Type F seemed to have a little damage but that’s probably not an issue as the shock absorbers would have borne the brunt of the impact with the ground. 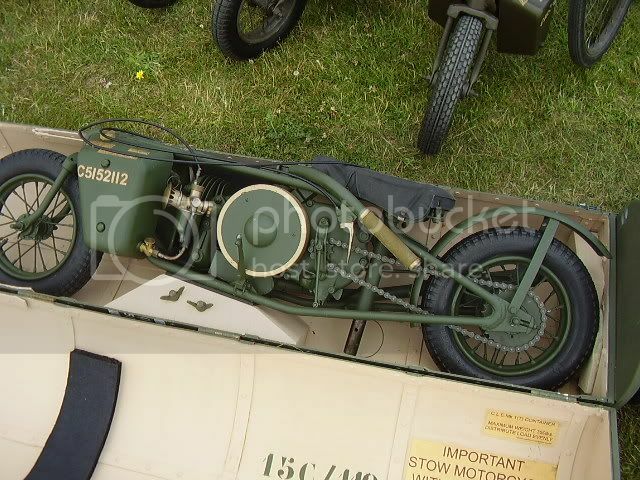 The inclusion of the wicker panniers and fuel cans is also a neat addition to the set and allows the modeller more options for use and display of the set. The Mark I containers were 5ft 6in in length and could carry a maximum load of 348 lbs. The kit comes in at 5ft so with the added crash pan should be about spot on. Standard wicker panniers were, according to my references, 3 ft in length by 1ft 7in in width and 1ft 4in in height. The kit baskets are just over 2ft 6in in length and the width and height look correct for scale. Add the parachute on top and you’d get an overall length of 3ft so I would hazard a guess and say these are pretty spot on too. This is an older set and has been around for many years, but the level of detail and casting holds up well and the age of the set doesn’t affect its level of accuracy. 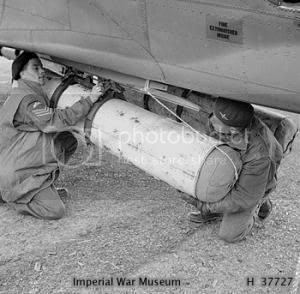 These items should be of interest to modellers wherever they want to imply an airborne connection; they could be used independently, loaded onto transport or carrier by troops, etc. So placement and usage is only limited by your imagination. Hanging from trees, building etc are all possibilities. I would have preferred a slightly different combination of containers, say one open and one closed Type F and 2 open and 2 closed Mk I, as I am not sure how many No 21 sets I’d want to drop into one spot. That said, having limited knowledge of the use of the Type F it may well have been used for a variety of other supplies too. 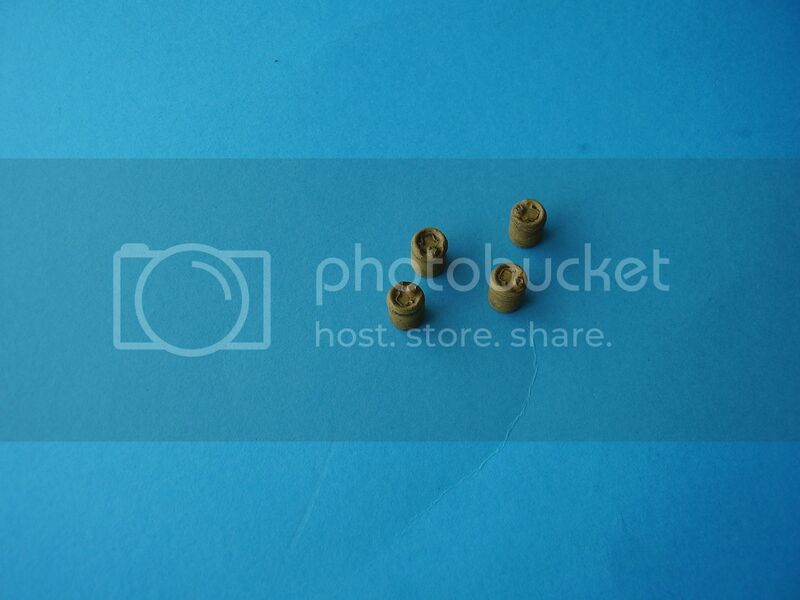 There is also clearly room for a Type E and Type H container set to be added to the range! I’ll need to do a bit more reading, but the only thing that might be missing is the loading trestle for the Mark I’s. Mark I containers could be dropped individually from the planes or loaded underneath the C47 in pairs, attached to trestles, something I hope MasterBox have considered for the C47. If dropped from underneath the aircraft, then the Mark I would have landed with the trestle attached, at least I believe so? The open containers are great as this will allow individual choice when stocking them up, connecting them with ground forces, etc. As far as I am aware this would have been standard equipment across the British and Commonwealth Paratrooper Forces and use with Resistance and Partisan groups would also be possible. Highs: A great little set of Airborne Accessories where you want to add interest and detail, or just suggest an airborne connection. A highly detailed and very useful set. Lows: I would have preferred a slightly different mix with an additional open Mark 1 container. These are a little expensive, even considering their uniqueness.